Location. 35° 7.806′ N, 79° 1.304′ W. Marker is in Fort Bragg, North Carolina, in Cumberland County. Touch for map. 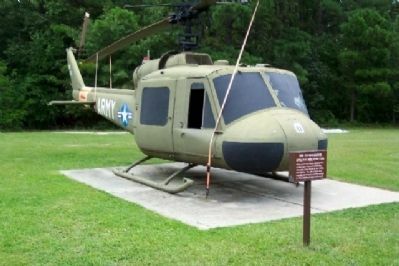 Marker and helicopter are on display about 200 feet east of the 82d Airborne Division Museum, Building C-6841, off Ardennes Street near Gela Street. Access is restricted due to Fort Bragg being an active military installation. Marker is in this post office area: Fort Bragg NC 28310, United States of America. Touch for directions. (within shouting distance of this marker); C-7 "Caribou" (within shouting distance of this marker); T-8 90mm Antitank Gun (within shouting distance of this marker); 328th Infantry Rock (within shouting distance of this marker); 4th Battalion, 325th Airborne Infantry Regiment (within shouting distance of this marker). Touch for a list and map of all markers in Fort Bragg. More. 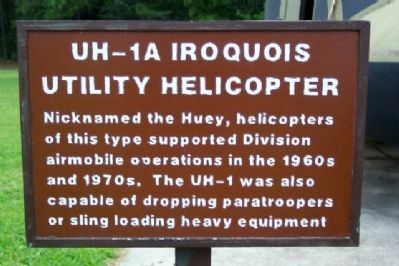 Search the internet for UH-1A Iroquois Utility Helicopter. Credits. This page was last revised on June 16, 2016. This page originally submitted on June 2, 2010, by William Fischer, Jr. of Scranton, Pennsylvania. This page has been viewed 780 times since then and 5 times this year. Photos: 1, 2. submitted on June 2, 2010, by William Fischer, Jr. of Scranton, Pennsylvania.